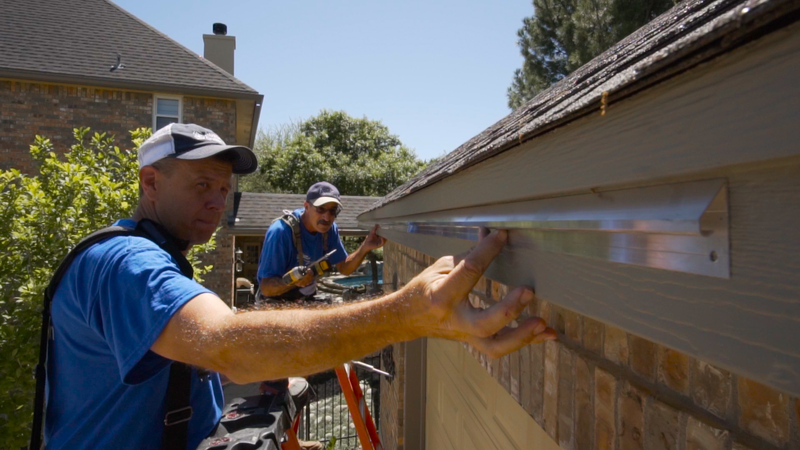 When you’ve decided it’s time to choose a new set of gutters for your home or business, there is a high likelihood that you will end up choosing seamless gutter installation. That said, it is good to learn about some of the basics in terms of installing seamless gutters, the type provided by Austin Gutterman. Seamless (or continuous) gutters are made at the job site. That means you aren’t receiving prefabricated gutters that will then be retrofitted to your home. These gutters are custom made to fit your home and only your home. The ultra-specific dimensions of your gutters will ensure you get perfect rainwater channeling that will keep water away from the pertinent areas of your home. The rainwater channeling that you get from seamless gutter installation will protect your home in several ways. First, rainwater channeling will keep water away from the foundation of your home, which can cause flooding and cracking of the foundation. Repairing your home’s foundation is one of the largest expenses you can incur over the life of your home. Protection from seamless gutters also protects your landscaping and topsoil from washing away, preventing oversaturation and the runoff of precious soil nutrients. Rainwater channeling also helps to shield windows and doors from water infiltration and damage, which will keep the most important areas of your home dry and prevent warping over time. For these reasons and many others, you should choose seamless gutter installation from Austin Gutterman. It is also important to know that, thanks to the elimination of seams, seamless gutters reduces the chances of leaks in your gutters. Again, they are custom made to fit your home only, allowing for the maximum level of protection available. Now that you’ve seen the advantages that seamless gutter installation can provide, contact Austin Gutterman and let us help create the perfect gutter system for you. You can find Austin Gutterman online at www.austingutterman.com and by phone at 512-450-1821.